One of the reasons I review books is to find stories that impress me and writers I can learn from and certainly there’s a lot of learning to be had in Exit Eleonora – Richard Allan’s debut novel. The story is first person and set in AD 2047. Earth is re-organising itself after a devastating plague that wiped out ninety percent of the world’s population. The new society is a drastic change, but seemingly positive in its pursuit of a meritocratic hierarchy and an even distribution of housing and food. We follow the journey of Charles Mincher, a dilettante journalist, dilettante because of the popularity of his previous work – a bestselling chronicle of the world’s destruction. With his success and the new regime of plenty he doesn’t need to work, but continues to do so, driven by an innate curiosity to experience the world as momentous events are happening. The late Isaac Asimov wrote science fiction in a way that celebrated intelligence. In societal works, the intelligentsia became the new elite, often proving their worth by the solving of some problem or dilemma. His experience as a physicist informed his stories and his particular brand of science fiction. One of the tricks he used was to bring two characters into a room and have them discuss a problem, taking us from science into pseudo-science with hardly a pause between one sentence and the next. Allan’s writing in Exit Eleonora has something of this. Our new world is, from initial description, a shrine to a new vision and radical thinking, much as Seldon’s ideas of rebirth informed the new society of the Foundation. But the world of Charles Mincher is much closer to our own and the solutions tangible ideas that build on elements of modern society. It is in this aspect that Exit Eleonora does best, as a thought commentary on a possible future. The scope of the work is huge and Allan captures the character of a distracted journalist writing as he wishes in a journal very well. The loquaciousness of Mincher’s prose conveys everything in detail, bringing with it a huge sense of weight. However this thick writing is also the book’s shortcoming, if you’re looking for a pacey narrative. Exit Eleonora might be a clever capture of one man’s soul, but it is not an easy read. Whole chapters are devoted to tangents of thought and reflection on the circumstances Mincher encounters. The plot shuffles and drags itself forwards beneath this burden, all but disappearing at times. On other occasions, the priorities are lost, making reading the dense wall of text an achievement with no reward. Mincher seems to need to describe every important thought or image several times, using this redundancy as a spring board towards more ideas and rationalisation. Unlike Asimov, the intellectualisation of everything has no respite in conversation or the social niceties. For the most part we experience it directly from one man as he narrates it to us. The late night reader looking to skim and get to the dialogue will find little anchorage as they hop. This is a book that demands you either engage wholeheartedly or use it as a doorstop. There is much to admire in Exit Eleonora. Writing as Mincher, Allan has an incredible turn of phrase. The captured mind on the page in front of us is astonishing and the thick prose is a character trait of this. If you are looking for one man’s intellectual experience of a future society, this is a great example. The paragraph bricks are littered with pearls. There is a knowing quality to the writing as well when it concentrates on events, throwing up vivid images of aircars, frosty wastelands, downtown Chicago and more. This really does feel like a person's memoir or journal from the future in that its quite selfish in its direction — as a person might elect to be when writing to record, ruminate and reminisce. 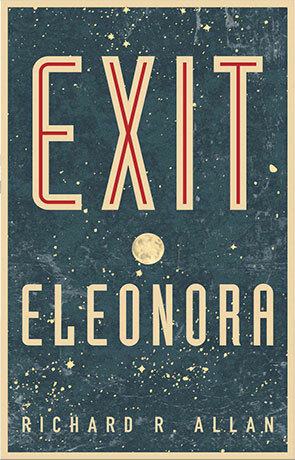 If you are looking for a page turning paperback, Exit Eleonora is probably not the book for you. However, if you want to truly get lost in a vision of the future for a few weeks of your life, pick this up and book your intellectual holiday. Written on 24th April 2015 by Allen Stroud.